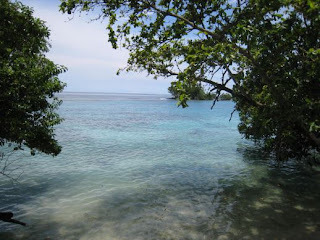 Here are some more photos from our Madang trip. The house at Rempi is nothing fancy. 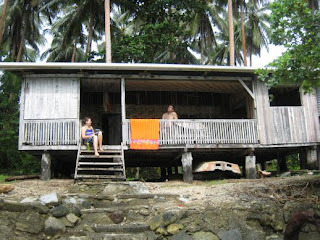 It’s just a little run-down house in a typical Papua New Guinean village. Spare furnishings, intermittent electricity, and a countertop two-burner gas stove. But the location is amazing. This is the view off the front porch. Stretching from that little island on the right hand side to the left of the photo is a reef, and inside of the reef is a great lagoon. It’s definitely the best snorkeling that I have experienced in PNG. Brian and I argue about whether it’s better than the snorkeling that we did in Fiji (I still hold out that Fiji was slightly better). When not in the water, Brian, Joy and I read books, played cards, and cooked for ourselves. We even made some PNG-style s’mores! 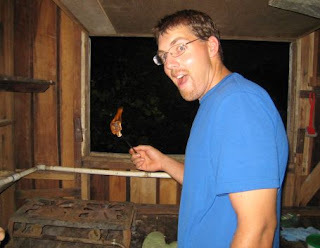 We had marshmallows (which you can only buy in Ukarumpa, by the way), but no graham crackers. Instead, we substituted little frog-shaped cookies with chocolate on one side, aptly named “Rokrok”. (Rokrok is the Pidgin word for frog.) Just keep the chocolate side on the inside, insert flaming marshmallow, and voila! It’s a s’more. (It’s a little hard to properly toast a marshmallow over a gas stove. It’s more a process of setting it on fire, then blowing it out, and then repeating the process over and over until the marshmallow is gooey enough). Love the ocean front property!! Makes our beach house look like a mansion. Glad to hear they keep you supplied with marshmellows in Uk. Did you fish while at the ocean this time?